Full of history and unassuming charm, Georgia's capital boasts diverse architecture, several museums, and amazing Georgian cuisine. Explore the cobbled streets of the Old Town, admiring historic buildings, visiting local cafes, or simply enjoying people-watching. 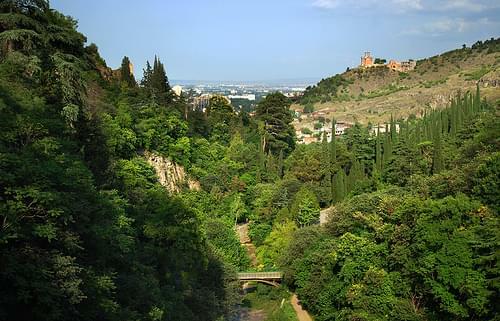 With its extensive grounds sprawled along the Tsavkisis-Tskali Gorge, this botanical garden boasts diverse flora and a waterfall. 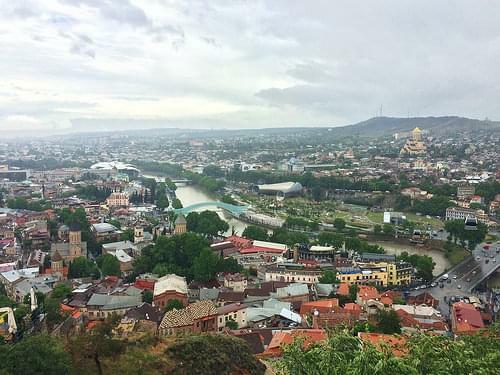 With a history stretching to the 4C, this fortress overlooks Tbilisi and houses frescoes depicting biblical and historical scenes. 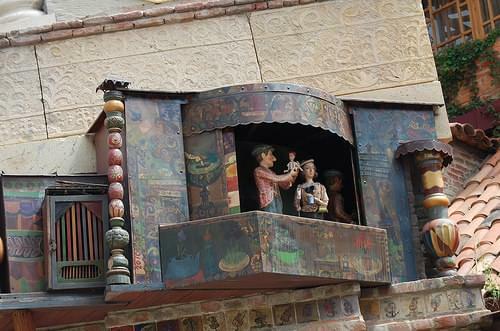 Book in advance not to miss the unique experience of this fantastic puppet theater, well-known for its remarkable performances. A final look at the Uplistsikhe cave town before we descend by shankar s.
Recognized as one of Georgia's earliest settlements, this ancient town is carved into the rock, featuring tunnels and chambers. Nestled amidst breathtaking scenery, the 13C castle retains much of its architecture and features two historic churches. Part of Georgia's national museum, this institute exhibits archaeological and ethnographic relics tracing the local history. 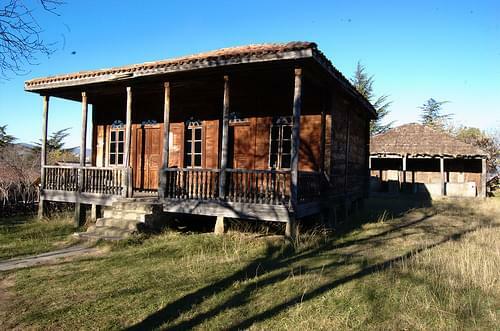 An open-air museum exhibiting ethnographic items, traditional buildings, and craftsmanship from various Georgian regions. 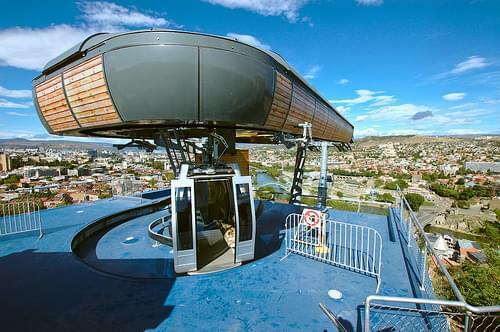 Take a cable car ride up to the Narikala Fortress, enjoying the comprehensive panorama of Tbilisi opening up before you. 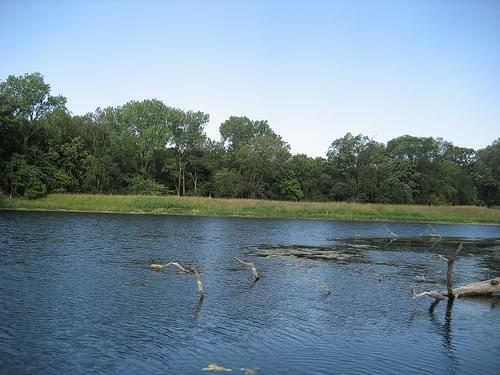 Named for its abundance of resident turtles, this small lake is a known recreational area, offering peaceful getaway from the city. With its uncommon architectural layout, fine decorative reliefs, and amazing views, this 6C church is worth the hike up a hill. Set on the border with Azerbaijan, this 6C monasterial complex is hewn into rock, boasting ancient murals and fascinating caves. 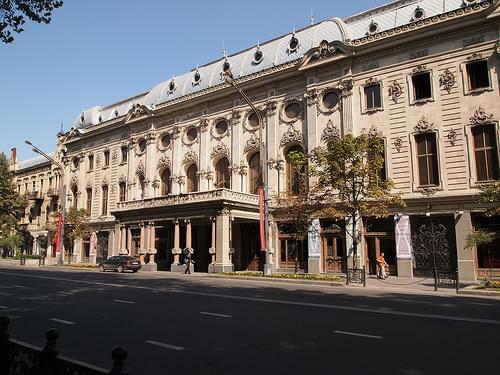 Admire the elegant 19C Rococo building as you explore the streets in the morning, then at night head to the theater to catch a show. 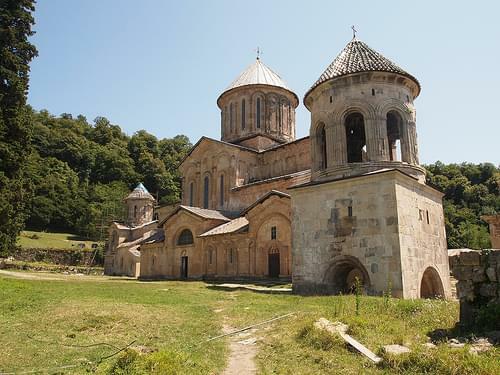 Georgia's largest church features nine different chapels, a wealth of ornamental details, an adjacent monastery, and a bell-tower. Perched on top of the lovely Sololaki Hill, this 20m aluminum statue commemorates the capital's foundation 1,500 years ago. 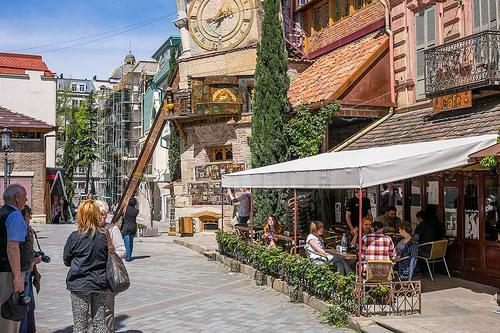 One of Tbilisi's historic neighborhoods, boasting architectural curios and a well-preserved 13C church. Visit this ancient monastery, whose history stretches to the 6C and whose wine is well-known in all of Georgia. 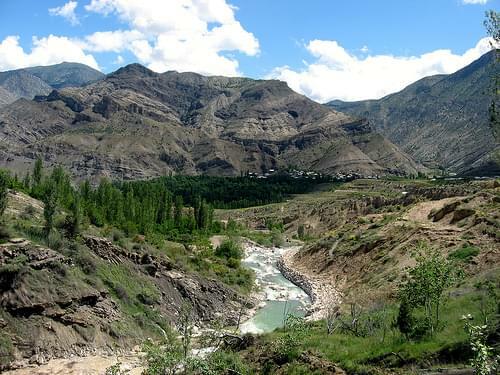 A national park set 60km from Tbilisi, encompassing the stunning landscape of the Algeti valley and the 2,000m high Mount Kldekari. This elegant 13C brick cathedral is home to several beautiful murals and paintings depicting bible scenes. 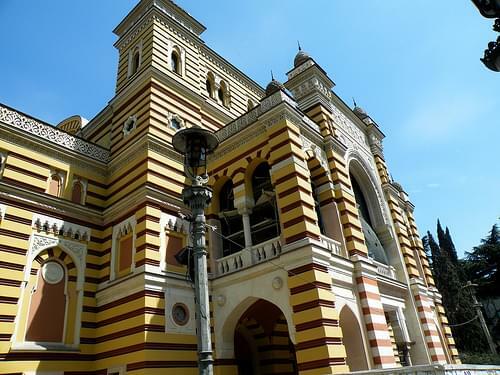 Housed in a beautiful 19C Moorish-Revival palace, Georgia's national theater offers an evening saturated with culture. Dating to the 6C and boasting traditional Georgian architecture, this church is home to a 17C altarpiece and some remarkable art. Established in the 19C, Tbilisi Circus offers a wealth of fun and exhilarating performances for the whole family. Sprawling along the Saguramo Range, Georgia's oldest national park boasts indigenous flora and fauna, offering hiking trails. 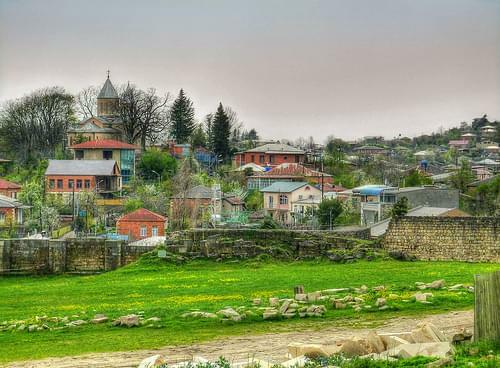 One of Georgia's most ancient cities dates to the 5C BC, boasting historic sites, religious monuments, and lovely nature all around. Tbilisi, commonly known by its former name Tiflis, is the capital and the largest city of Georgia, lying on the banks of the Kura River. Founded in the 5th century by the monarch of Georgia's ancient precursor the Kingdom of Iberia, Tbilisi has since served, with intermissions, as the capital of various Georgian kingdoms and republics. Located on the crossroads of Europe and Asia, Tbilisi's varied history is reflected in its architecture, which is a mix of medieval, classical, Middle Eastern, Art Nouveau, Stalinist and Modernist structures. When nearby, visit its museums, various theaters, and surrounding fortresses. 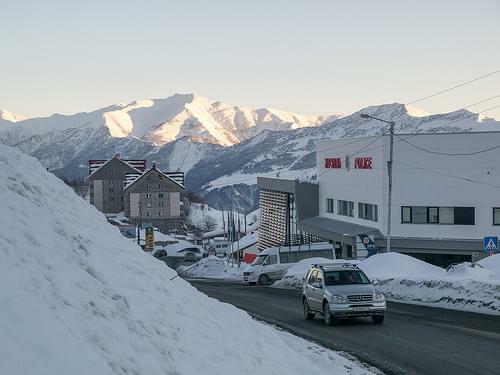 Set on the slopes of the Caucasus Mountains, this ski resort is popular among skiers, offering free-riding and ski-touring trails. 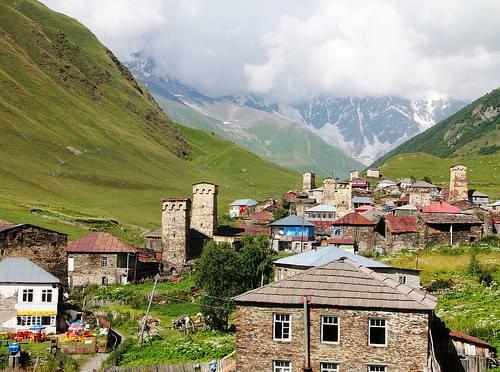 Wander around the streets lined with tavern, hotels, and guesthouses, admiring the mighty Caucasus mountains surrounding the town. 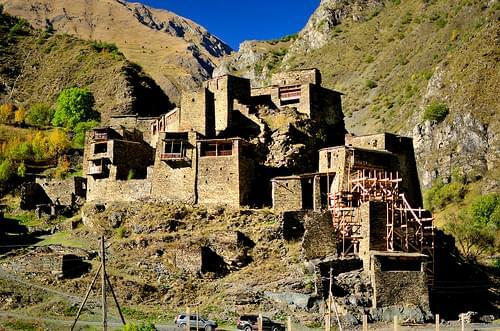 A highland village on the slopes of a gorge, featuring a clustered formation that historically comprised a fortification system. 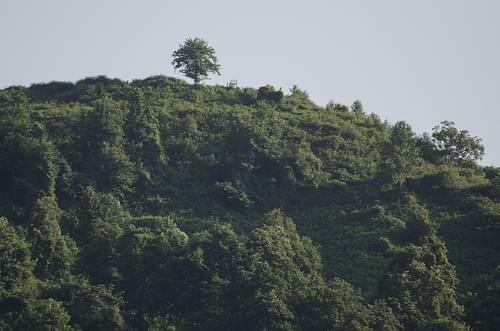 Perhaps one of Georgia's best recognized landmarks, this 14C church is surrounded with stately mountains riddled with trekking paths. Gudauri is a ski resort located on the south-facing plateau of The Greater Caucasus Mountain Range in Georgia. The resort is situated in the Stepantsminda District, at an elevation of 2,200m above sea level with skiable area enjoying maximum exposure to the sun. The slopes of Gudauri are completely above the tree line and are best for free-riders and are generally considered to be avalanche-safe. 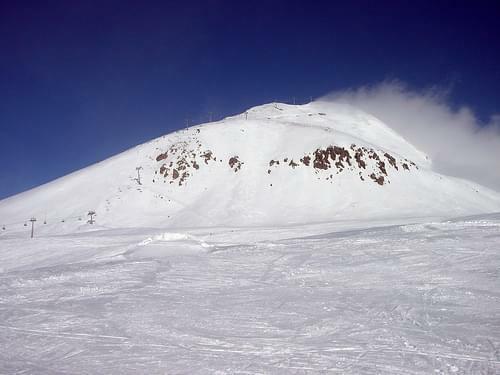 The ski season lasts from December to April. Heliskiing is also available throughout the season. Little visited, the city nonetheless offers a few notable attractions, such as historic palaces, lovely nature, and cultural sites. Stroll along the streets window-shopping, go to one of the museums, or spend the afternoon walking around the botanical gardens. Comprised of several fine palaces, this complex exhibits archaeological findings, various architectural styles, and historic items. 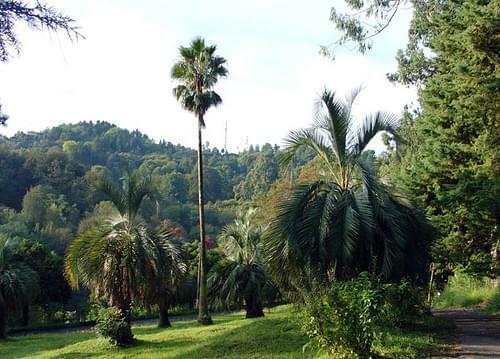 Opened in the 19C, this botanical garden offers many plants from different continents, extensive grounds, and a peaceful atmosphere. Georgia's second largest city is home to several historic landmarks, ancient castles, and nearby natural attractions. 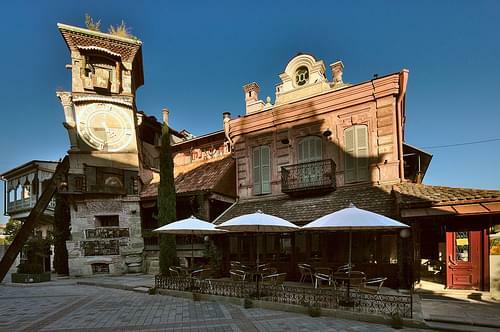 A popular Black Sea resort, Georgia's third largest city boasts vibrant nightlife, 19C buildings, and a lively atmosphere. Nestled amidst breathtaking mountains 2,100m above sea level, this traditional town retains a unique rustic charm and a few relics. 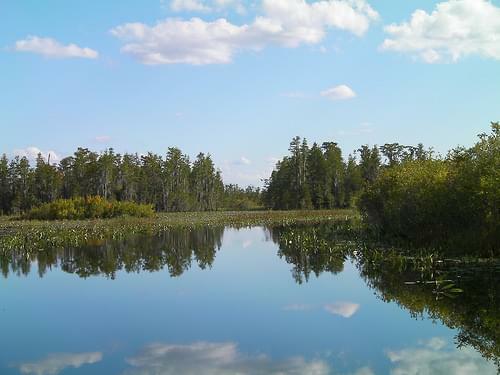 A national park encompassing lakes and rivers, offering a wealth of fun activities including kayaking, hiking, and bird-watching. 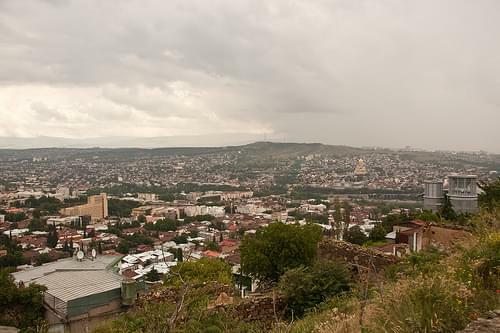 Zugdidi is a city in the Western Georgian historical province of Samegrelo (Mingrelia). It is situated in the north-west of that province. 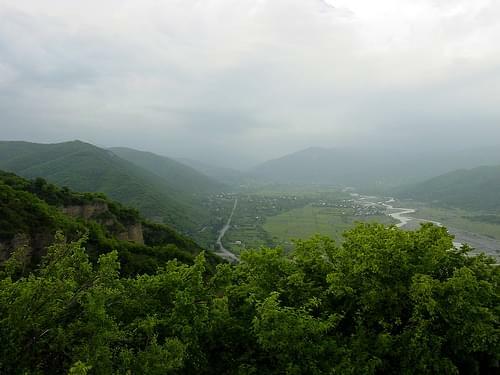 Zugdidi is the capital of the Samegrelo-Zemo Svaneti region, which combines Samegrelo (Mingrelia) and upper part of Svaneti, and the center of the Zugdidi Municipality within. 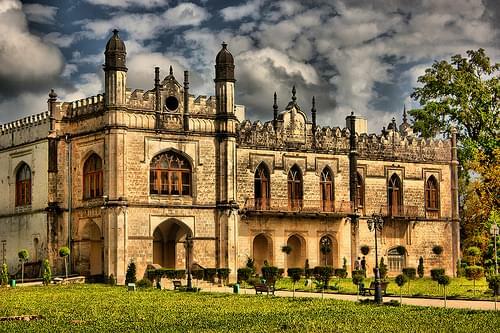 Architectural sights of the city are the Queen's palace and Niko's palace (now the Dadiani Palaces museum, both of the 19th century), as well as cathedral, churches, a botanical garden, and museums. 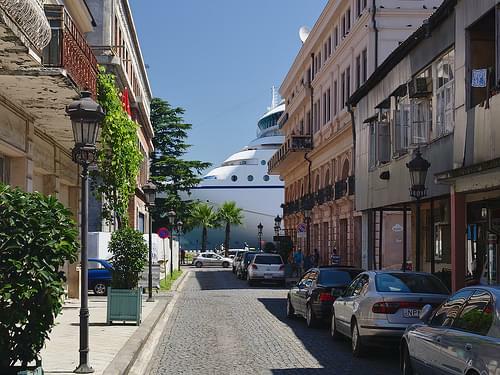 Walk around the street, admiring 19C building facades, wonderful local restaurants, and a vibrant waterfront. Stretching for over 7km, this seaside park is full of modern sculptures, indigenous flora, and beautiful scenery. 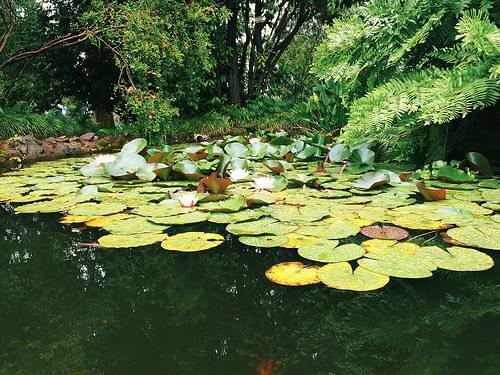 The Soviet Union's largest botanical garden boasts over 2,000 plants, maintaining 9 diverse habitats and wonderful scenery. Listen for the tune that marks the hour, or trace the positions of sun and moon on the face on this charming tower clock. Engulfing a large part of the Lesser Caucasus, this gorgeous national park is home to waterfalls and lush nature. 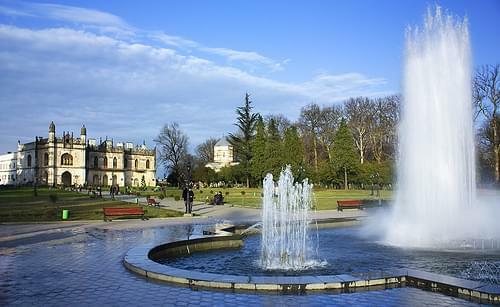 Stroll around the park for a respite from the busy streets, visit the aquarium or the lake, and be sure to drop by the dolphinarium. A central spot for meet-ups, concerts, and cultural assemblies. Admire the statue of Medea or simply enjoy a snack in the sun. 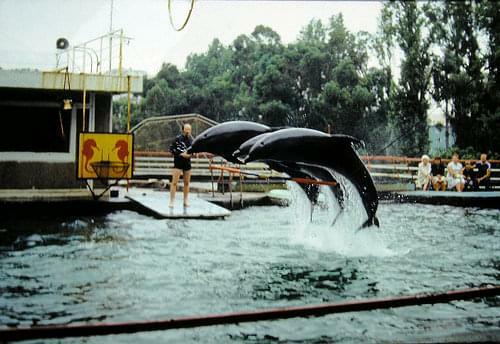 Catch a show at the local dolphinarium for a chance to watch leaping dolphins, or simply take a few photos with these creatures. An archaeological museum exhibiting items from the Bronze Age until the 16C, including numismatics, pottery, jewelry, and others. 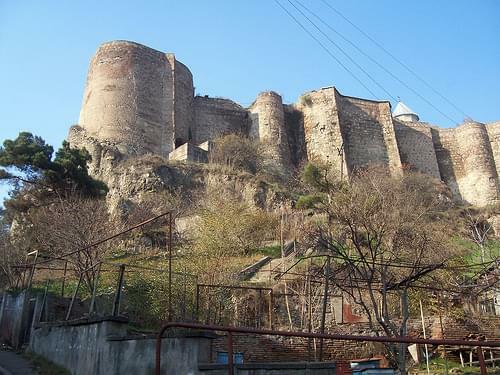 Walk around the ruins of this 6C citadel, perched on a cliff overlooking the Black Sea coast. 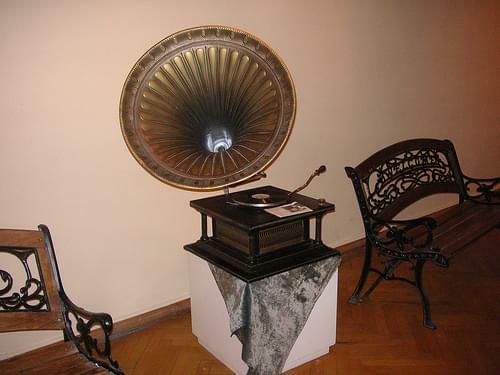 A museum tracing the history of technological progress in Batumi from the 19C onward, exhibiting relics and photographs. With a modern design showcasing the Georgian alphabet, this 150m tower houses a restaurant set on a revolving observation deck. Flanked on both banks by a biodiverse habitat, this river offers stunning surrounding, hiking, rafting, and kayaking. 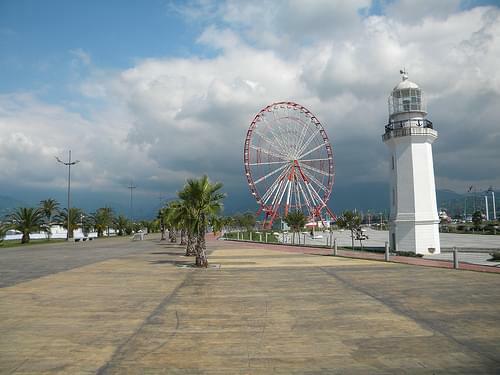 Batumi is the second largest city of Georgia, located on the coast of the Black Sea in the country's southwest. 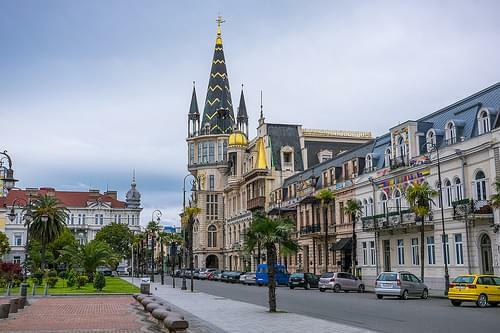 Situated in a subtropical zone near the foot of the Lesser Caucasus Mountains, Batumi is a popular tourist destination known for its varying weather–it is a bustling seaside resort during warm seasons, but can get entirely covered in snow during winter. 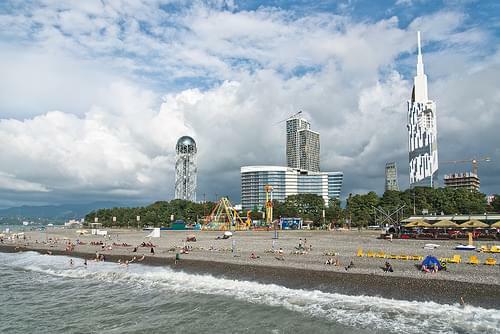 Much of Batumi's economy revolves around tourism and gambling. 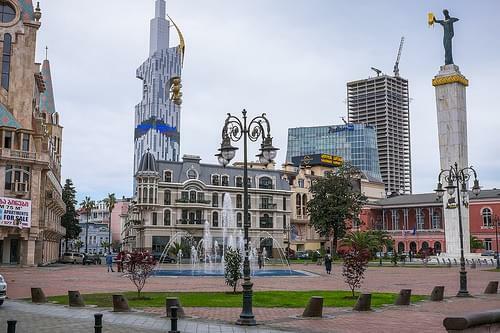 Since 2010, Batumi has been transformed by the construction of modern high-rise buildings, as well as the restoration of classical 19th-century edifices lining its historic Old Town. 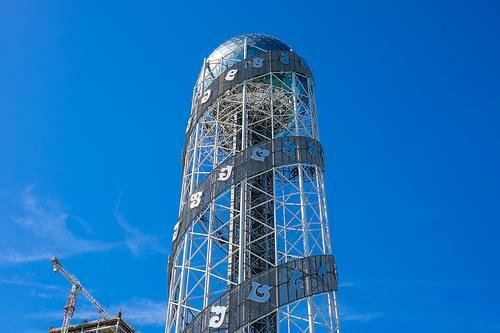 Other attractions include museums, botanical garden, and dolphinarium. Stroll along the streets, taking in the history of this former capital, visiting some local monuments, and enjoying the ambiance. 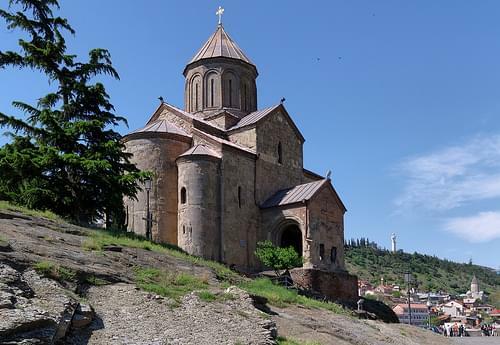 Dating to the 12C and retaining most of its original Georgian architecture, this reconstructed hilltop cathedral is a historic gem. Boasting superb Georgian architecture, this 12C monastery complex houses remarkable wall paintings and other notable cultural items. Set on a cliff with a gorgeous view, this 11C monastery complex is full of legends and frescoes, also offering great hiking nearby. 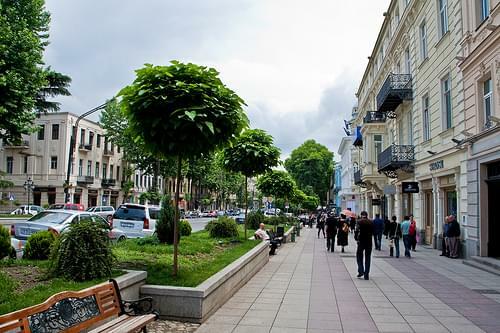 Kutaisi is the legislative capital of Georgia, and its third largest city. 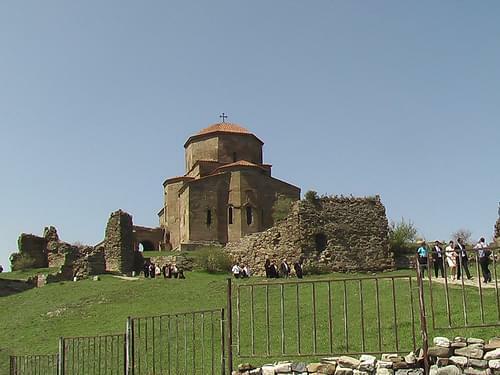 The landmark of the city is the ruined Bagrati Cathedral, built by Bagrat III, king of Georgia, in the early 11C. 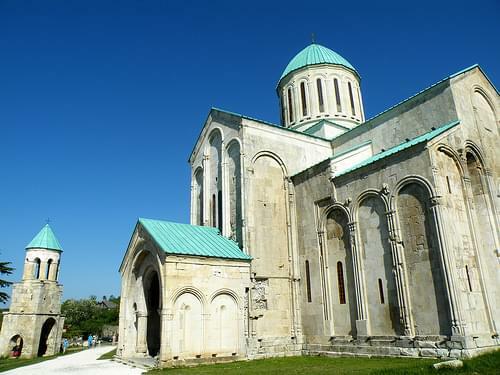 The Bagrati Cathedral, and the Gelati Monastery near the city, are UNESCO World Heritage Sites. 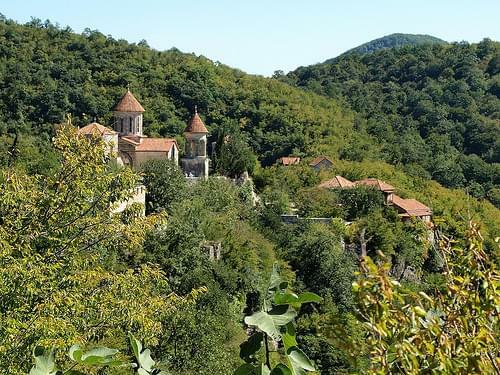 Besides the churches, there are many interesting places in Kutaisi, such as: Sataplia Cave, where one can observe footprints of dinosaurs; nearby castle ruins, and some hiking. Cobbled streets, picturesque buildings, and a charming small-town atmosphere awaits you on your exploration of this city center. Dating to the 11C, this beautiful church is an architectural gem, boasting remains of ancient icons, frescoes, and murals. This monasterial complex is home to a 4C church, architectural curios, royal tombs, and ancient frescoes. Mtskheta is a city in Mtskheta-Mtianeti province of Georgia. 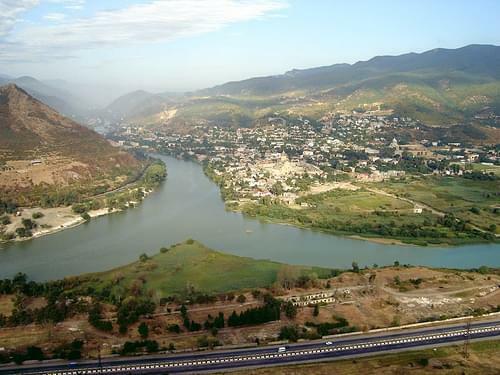 One of the oldest cities of Georgia, it is located approximately 20km north of Tbilisi at the confluence of the Aragvi river. 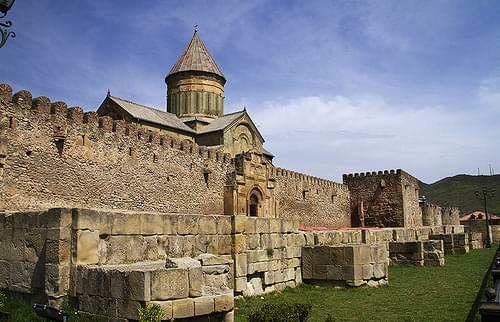 Due to its historical significance and several cultural monuments, the "Historical Monuments of Mtskheta" became a UNESCO World Heritage Site in 1994. 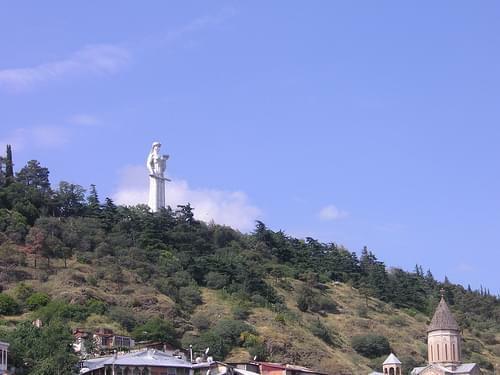 As the birthplace and one of the most vibrant centers of Christianity in Georgia, Mtskheta was declared as the "Holy City" by the Georgian Orthodox Church in 2014. Make sure to visit its churches and fortresses when you're in the area. 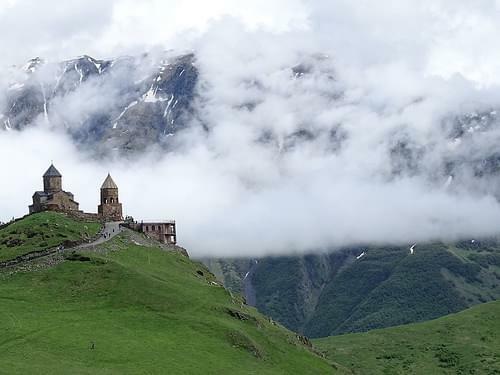 Known as the "Switzerland of Armenia," this beautiful alpine town features historic sites, museums, and access to the national park of the same name. 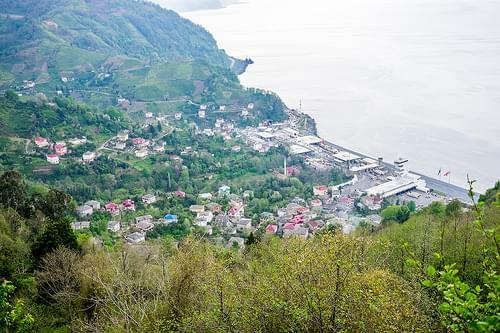 Explore the ins and outs of this charming town, getting to know the friendly locals, and admiring the amazing scenery. 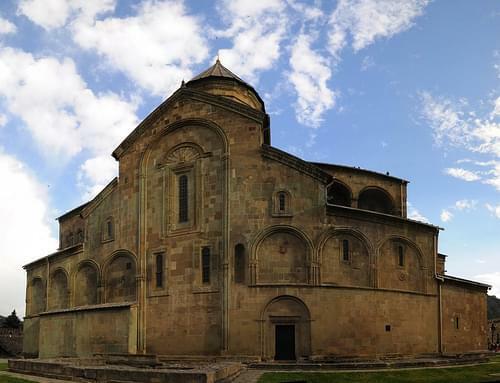 Built in the 13C, this monastic complex features the large and beautiful St. Astvatsatsin Church, a 13C refectory, and lovely surrounding nature. Preserved as an "Old Town," get to know Dilijan of the past with a stroll down this historic street. With exhibits dated to local history, nature, and art, truly get to know this region of Armenia with a visit to this renowned museum. A magical blend of historic and modern, Armenia's capital is set against the backdrop of breathtaking surrounding mountains. Literally meaning "gorge of flowers," this beautiful resort town offers the best ski slopes in the country. Situated high on the slopes of Mount Aragats, this ancient fortress dates to the 7C and offers stunning views of the surrounding landscape. Hike through a 3C forest to reach this ruined monastery, dating to the 11C, enjoying beautiful nature and fabulous views. A beautiful example of temple architecture of that period, this 10C stone temple was a medieval center of science and education. With mountains, valleys, fields, forests, and rivers, this diverse national park is also home to several ancient monasteries. 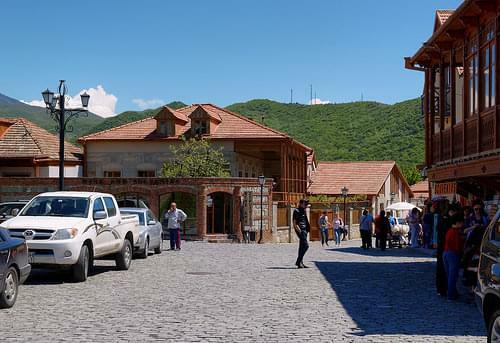 Dilijan is a spa town in the Tavush Province of Armenia. 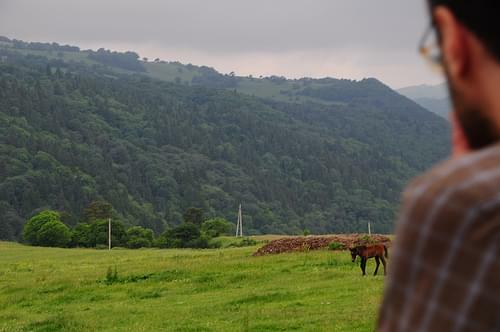 Usually called Armenian Switzerland or Little Switzerland by the locals, it is one of the most important resorts of Armenia, situated within the Dilijan National Park. 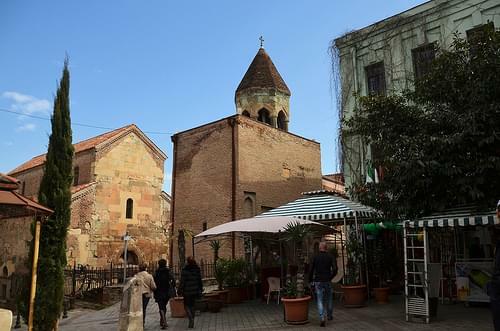 The forested and reclusive town is home to numerous Armenian artists, composers, and filmmakers and features some traditional Armenian architecture. The Sharambeyan street in the center, has been preserved and maintained as an "old town", complete with craftsman's workshops, a gallery and a museum. Hiking, mountain biking, and picnicking are popular recreational activities. 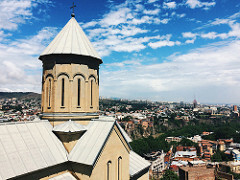 Explore the streets of Armenia's capital city, admiring the historic architecture, modern atmosphere, and gorgeous surrounding landscapes. Stroll through Yerevan's main square, home to some of the capital's major sites. Try to visit at night when the square is beautifully illuminated. This massive staircase is a popular place to walk around, hang out, and grab a cup of coffee in one of the many cafes and restaurants. Stroll along the shores of Areni Lake, enjoying the tranquillity of the park, and make sure to check out the statue of Mother Armenia. Escape the bustle of the city with a stroll through this lovely park, founded in the 18C and home to gardens, statues, ponds, and more. With archaeology, ethnography, numismatics, and more, this incredible museum houses over 400,000 artifacts from throughout Armenia's history. Dedicated to the artistic and literary heritage of Serhei Parajanov, this museum is one of Yerevan's most popular and is home to over 1,400 artifacts. With collections of Russian and Western European art, this museum is also home to the world's largest collection of Amenaian art. The name "Yerevan" was derived from the name of this fortress, which was one of the country's most important political, economic and cultural centers..
Home to over 200 different species, this renowned zoo promises fun for all ages. Dedicated to those killed in the Armenian Genocide, this is the nation's official memorial of that time. Shop for your souvenirs at this lovely market, where local artists come to sell their traditional works of art. Armenia's capital is one of the country's oldest cities. 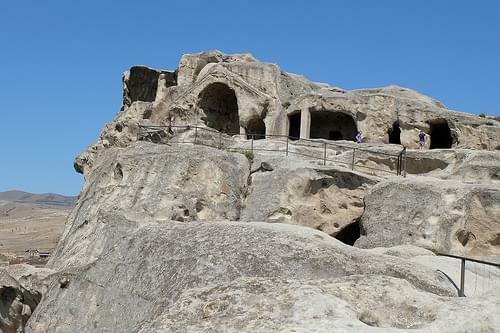 It boasts several ancient features, including a 6C BC fortress. 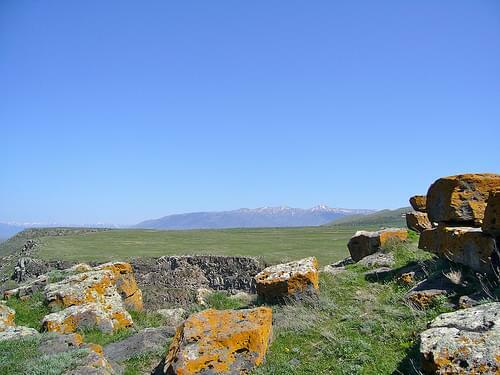 Head outdoors to one of Armenia's most magnificent parks, home to the beautiful Lake Sevan, and an array of local flora and fauna. See a show or just pay a visit to Yerevan's elegant renowned opera theater. This renown museum and research institute is home to an amazing collection of medieval manuscripts covering a wide variety of topics. Learn about the history and production of famous Armenian beverage brand Noy with a visit to the factory. 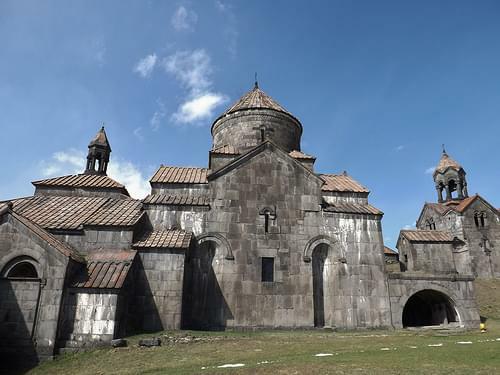 Armenia's largest cathedral was completed in 2001 in honor of 1,700 years of Christianity in Armenia and was named for the saint who brought it here. 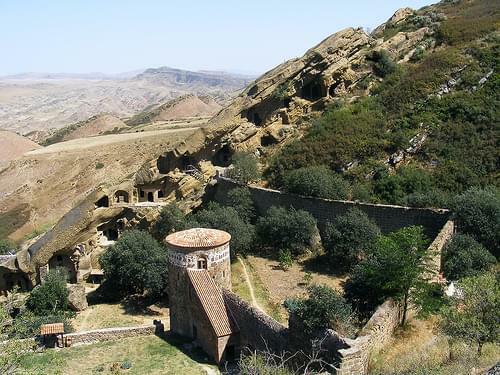 Established in the 7C, the "deep dungeon" monastery imprisoned Gregory the Illuminator, the man who brought Christianity to Armenia. 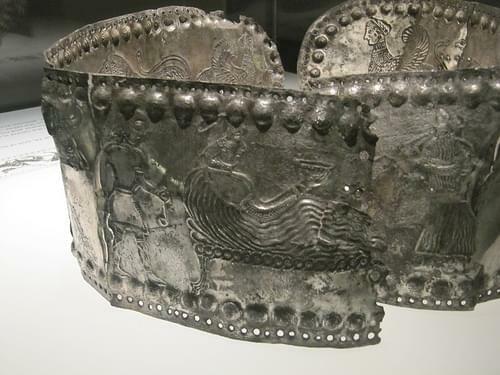 The history of Yerevan dates back to the 8th century BC. Under Iranian and Russian rule, it was the center of the Erivan Khanate from 1736 to 1828 and the Erivan Governorate from 1850 to 1917, respectively. After World War I, Yerevan became the capital of the First Republic of Armenia as thousands of survivors of the Armenian Genocide in the Ottoman Empire arrived in the area. 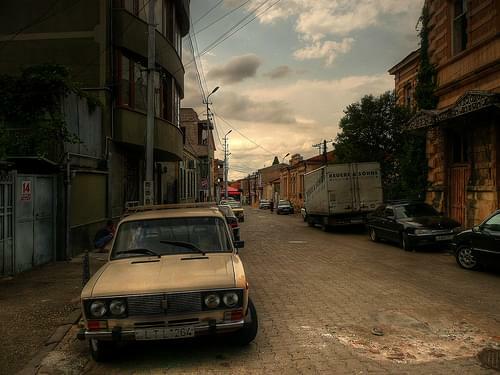 The city expanded rapidly during the 20th century as Armenia became part of the Soviet Union. In a few decades, Yerevan was transformed from a provincial town within the Russian Empire to Armenia's principal cultural, artistic, and industrial center, as well as becoming the seat of national government. 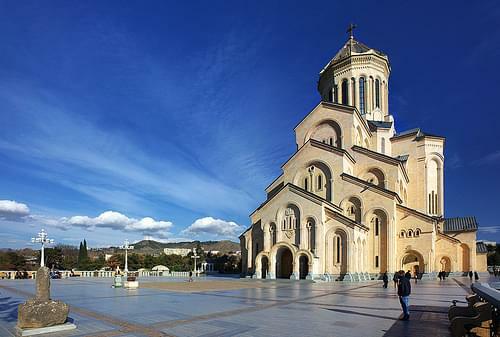 Starting your trip in the trendy art scene and naturally beautiful capital, make your way around this small but mighty country, sampling delicious local wines, hiking through breathtaking nature, and getting to know Georgian history on this grand tour.